The leaves are beginning to turn (even if it is unseasonably warm here in PA) and pumpkin flavors are in the minds of kids and adults everywhere. So today, I made my first pumpkin treat of the season! 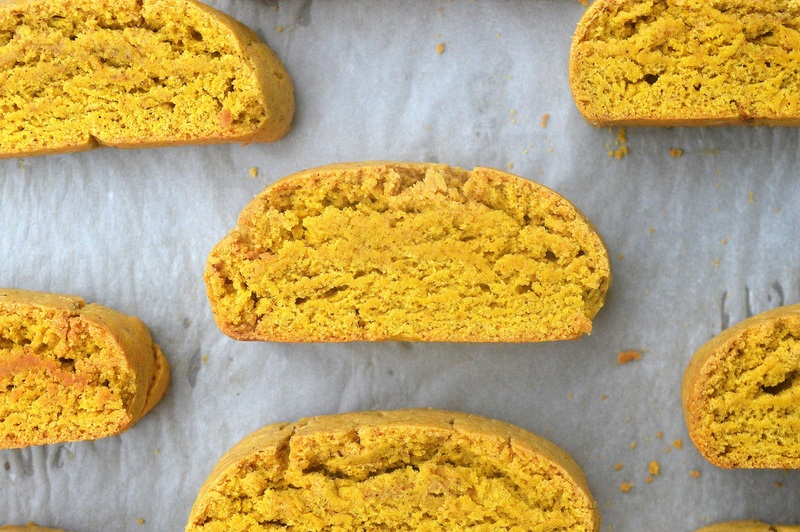 This Pumpkin Biscotti Recipe is easy, pretty and delicious! This Pumpkin Biscotti Recipe was worth the wait. The girlie has been begging to make pumpkin…anything since the end of August. I kept saying nooo the 2nd week of October, we have to wait…Lol! To me, it’s like listening to Christmas music too early. Am I alone in this?? Anyone else feel this way? Making biscotti is easy, people think it is hard, however, once you make biscotti, you say to yourself “that was easy” and then do it again and again. Unlike waiting for the each batch of cookies to be done, then wait for the tray to cool a bit, the scoop or form more cookies and do it all over again…Making biscotti is as simple as 1-2-3. I’m a self-proclaimed cookie monster. Really! Cookies, homemade cookies that is, are my Achilles heel. I can’t stop at one. I just keep eating them. I love a cookie or three for breakfast. My son Connor (15) follows exactly in my footsteps when it comes to cookies (love that kid). Biscotti are one of his favorites and this Pumpkin Biscotti Recipe did not disappoint him. If you like Biscotti as much as my son and I do, check out my other biscotti recipes: Apple Cider Biscotti, Carrot Cake Biscotti, and Eggnog Biscotti. Make these as full of pumpkin pie spice as you like and then decide to drizzle them with a cinnamon drizzle or make them a little more special by also adding a thin dark chocolate drizzle…Why not? The flavors all go well together. When I make biscotti, I make them on the softer side. They are firm and have a good crunch, but they are not all dried out like you would find in a coffee shop. Just my family’s preference. You decide how you want them. 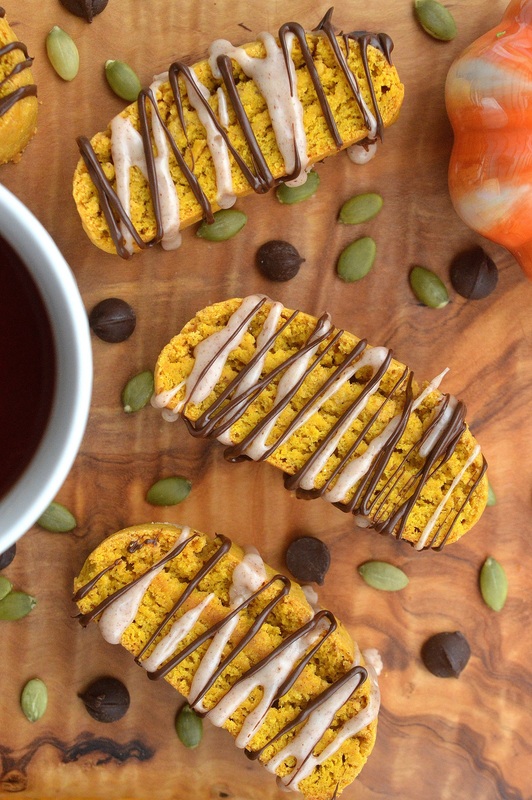 This Pumpkin Biscotti Recipe is a home run for anyone who enjoys pumpkin, or fall treats! They make a great food gift too! Let me know what you think! Tag me on Facebook or Instagram if you make them at @SouffleBombay or #SouffleBombay. I’d love to see your creations! In your mixing bowl, combine butter and sugars. Add in pumpkin, egg, salt, spices, flour and baking powder and mix until dough is fully incorporated. Remove dough from bowl onto a pastry board or parchment paper lined countertop. Halve the dough and roll the dough into a foot long log. Making it even in thickness and height. Place it on a parchment paper-lined baking sheet. Allow 2 inches between dough logs and side of the pan. Allow biscotti to stand 3 minutes. Carefully cut into ½ inch wide slices. Turn slices onto one size, allowing a little space between each. Remove from oven and carefully flip each piece to the opposite side. **If you want biscotti on the softer side. once you turn oven off, allow them to sit in hot oven with the door closed another 5 minutes. ***If you want hard biscotti, once you cut them from the log into individual slices lover oven to 300 degrees and allow to cook bake 20 minutes, flip over and do the same.Turn oven off and allow them to sit in the oven until the oven cools. To make the Cinnamon Glaze, combine sugar, water, and cinnamon and mix until smooth. You don't want it runny, you want it thick, yet able to drizzle. Spoon glaze into a plastic baggie, snip off one end and drizzle over biscotti. Melt chocolate (if using) and do the same. Allow glazes to dry. Store in a cookie jar or other airtight container for up to 2 weeks. If you don't have pumpkin pie spice simply combine 1 TBS cinnamon, 1 tsp nutmeg, 1 tsp ground ginger, ½ tsp allspice and ½ tsp ground cloves, mix well. I may have missed it, but I don’t see an initial oven temperature. I only see that I should lower the temperture to 325 degrees after baking for 25 minutes. You didn’t miss it it isn’t there. Most baking temps are 350 degrees, so that is what I will start with. These look wonderful! Could nuts or raisins be added?